I accidentally pushed the living room project up by a few months/years today … by buying a new couch. Over the phone. It was a spontaneous purchase of the best kind. 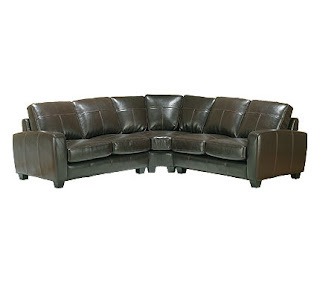 I’ve had a picture in my mind for months about the perfect couch for the upstairs living room (where the red couches are) – 1) comfy, 2) genuine leather, 3) not too deep or too narrow, 4) armrests on both ends (shocking how many couches don’t have this nowadays), 5) curved sectional with connecting hardware, 6) not too ornate or too casual, 7) not insanely expensive. The combination was hard to find. I’d shopped around in Minneapolis, and then given up for a while this spring because I wasn’t finding anything I liked. So instead I focused on finishing the guest bedroom, and thought I’d start looking for couches again in the summer or fall. Then, my cousin and I walked into a shop in the Old Market of Omaha, and that’s where I found it – the perfect leather sectional. As close to the comfort level of my red couches as I think I’m going to get. Beautiful walnut-colored genuine leather. Zipper attachments for the pillows so they don’t slide out of place. A curved corner seat. Armrests (and pretty ones at that). Best of all? A great price, and a steal on the shipping arrangements. It won’t be here for 4-6 weeks, which is just fine because I have to sell the red couches and paint the room first. Yes. Because when you find what you’ve been looking for, you go for it. Right? PS – I love you, ma! Thanks for not only teaching me how to tend a garden, but how to love doing so. I can hardly wait until you can come see what I planted this weekend.